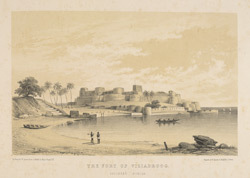 Lithograph of the Fort at Vijayadurg by William Spreat after an original sketch by Robert Pouget and one of a series of 'Views in India and in the vicinity of Bombay' dated c.1850 and published in London. The Fort at Vijayadurg is located at the mouth of the Vaghotan creek on the western coast of India between Goa and Bombay. The fort, built by the Adil Shahi dynasty of Bijapur, was strengthened and enlarged by the Maratha ruler Shivaji from 1669. While main entrance to the fort on the landward side was protected by outworks and a moat, the inner circuit of walls include 20 towers and rise to the height of 36m.